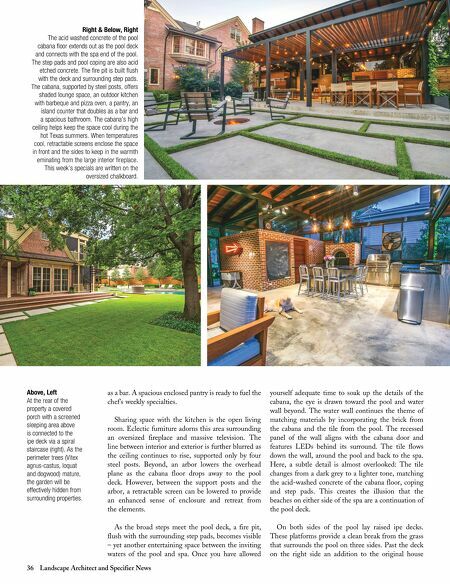 36 Landscape Architect and Specifier News as a bar. A spacious enclosed pantry is ready to fuel the chef's weekly specialties. Sharing space with the kitchen is the open living room. Eclectic furniture adorns this area surrounding an oversized fireplace and massive television. The line between interior and exterior is further blurred as the ceiling continues to rise, supported only by four steel posts. Beyond, an arbor lowers the overhead plane as the cabana floor drops away to the pool deck. However, between the support posts and the arbor, a retractable screen can be lowered to provide an enhanced sense of enclosure and retreat from the elements. As the broad steps meet the pool deck, a fire pit, flush with the surrounding step pads, becomes visible – yet another entertaining space between the inviting waters of the pool and spa. Once you have allowed yourself adequate time to soak up the details of the cabana, the eye is drawn toward the pool and water wall beyond. The water wall continues the theme of matching materials by incorporating the brick from the cabana and the tile from the pool. The recessed panel of the wall aligns with the cabana door and features LEDs behind its surround. The tile flows down the wall, around the pool and back to the spa. Here, a subtle detail is almost overlooked: The tile changes from a dark grey to a lighter tone, matching the acid-washed concrete of the cabana floor, coping and step pads. This creates the illusion that the beaches on either side of the spa are a continuation of the pool deck. 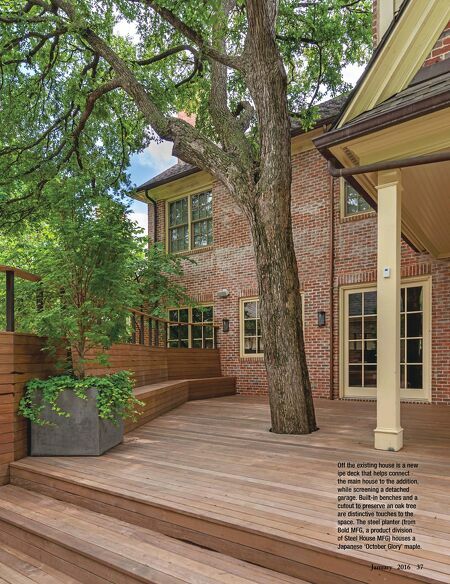 On both sides of the pool lay raised ipe decks. These platforms provide a clean break from the grass that surrounds the pool on three sides. Past the deck on the right side an addition to the original house Above, Left At the rear of the property a covered porch with a screened sleeping area above is connected to the ipe deck via a spiral staircase (right). As the perimeter trees (Vitex agnus-castus, loquat and dogwood) mature, the garden will be effectively hidden from surrounding properties. Right & Below, Right The acid washed concrete of the pool cabana floor extends out as the pool deck and connects with the spa end of the pool. The step pads and pool coping are also acid etched concrete. The fire pit is built flush with the deck and surrounding step pads. The cabana, supported by steel posts, offers shaded lounge space, an outdoor kitchen with barbeque and pizza oven, a pantry, an island counter that doubles as a bar and a spacious bathroom. The cabana's high ceiling helps keep the space cool during the hot Texas summers. When temperatures cool, retractable screens enclose the space in front and the sides to keep in the warmth eminating from the large interior fireplace. This week's specials are written on the oversized chalkboard.